When I was a boy, I used to take a toy, whether or not it was meant to represent something aeronautically sound, and I would hold it out in front of me and “fly” it above the sofa mountains of our living room or, outside, over the terrain in our East St. Louis yard: a stone wall, peonies and day lilies, an actual manual pump (like the ones in Westerns) drawing air from an unproductive well, apple trees and woods. The scale of everything would be altered by whatever I was holding in my hand, an airplane, a Superman, or a scuba diver. I wanted to be a scuba diver more than anything in grade school. (Or a sardonic gambler with a six-shooter on my hip in a frontier Nebraska saloon.) A little molded plastic figure of a diver, lime green or blue, would swim over vast underwater canyons carpeted with bluegrass. I was the invisible giant holding him up: a giant or a god. The world was my diorama. Everything became more interesting. 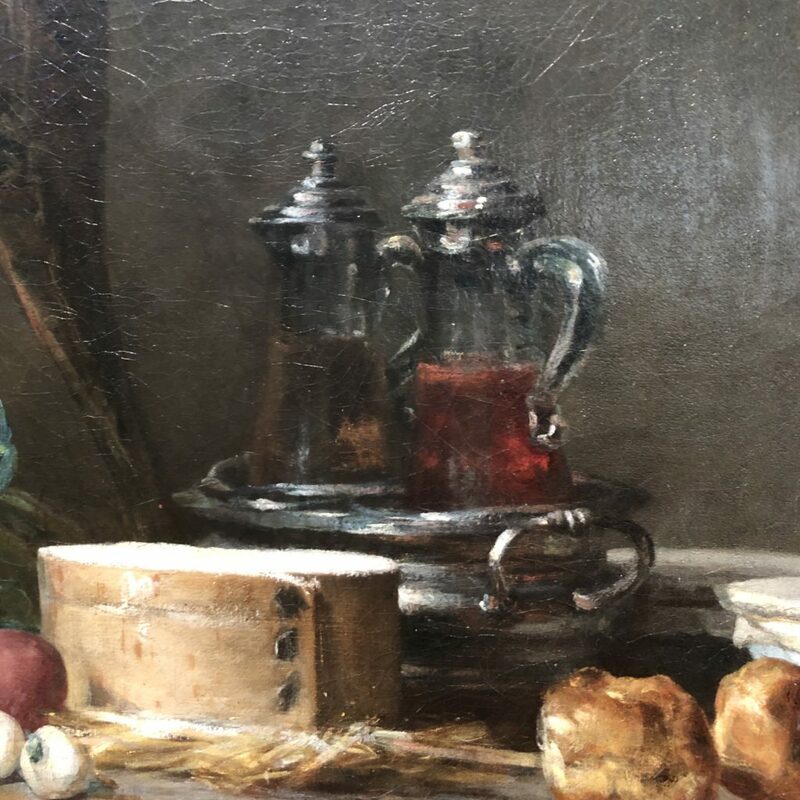 I get the same feeling looking at a close-up detail I shot a few months ago at The Getty of a masterful Chardin still life I’d never seen before. Up close, the objects on Chardin’s mantle look massive, like magical alien minarets and a flat-topped stadium, a terrain out of Gulliver’s Travels. It’s a strange city built with things from his kitchen. Bachelard would have been nudged by this scene into a reverie, another unique poetic measure of space, if he imagined everything in the picture a thousand times larger than its actual size. (I suppose you have to leave out the fish.) It becomes like one of those clockwork models of cities rising up out of the earth during the title sequence of Game of Thrones. This effect is partly what draws me to enlarged images of ordinary objects—making them massively larger on canvas than they are in my daily, disenchanted world—to bring out their formal resonance with so many other things with similar shapes and tones. In a way, I think this is related to what Braque meant in his notebooks about the centrality of transformation in painting, the alchemy that takes an ordinary interior space, full of utterly familiar things, and turns it into a painting’s dream. His transformations were more radical, obviously, but Chardin is just as concerned with the feel of the paint itself and the tactile quality of what’s seen–making you aware of the medium that invites you into its world, the same as yours, but cooler, fresher, more alive. 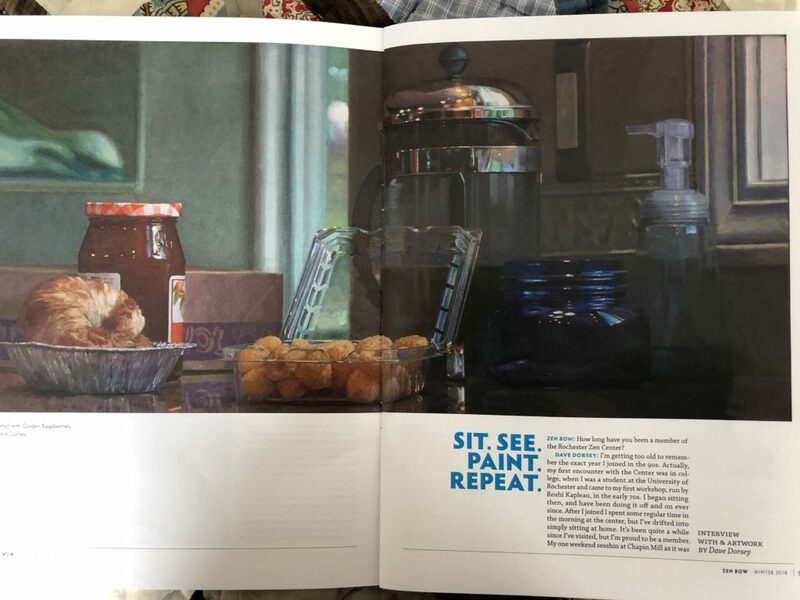 I was familiar with many of the objects in this picture from his other paintings, because he kept returning to these old inanimate friends again and again, as still life painters like to do: shallots, garlic, a couple gougeres (they look like cream puffs), several ceramic bowls with covers secured by lengths of twine, and a silver dish designed to hold two glass-and-silver cruets for oil and vinegar. Freshly-caught mackerel in the background are the wild card. 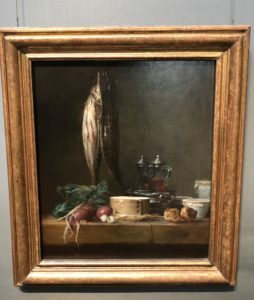 Chardin did this at least a couple times—showing you fish and game ready for cooking. But he indicates the shining white underside of the fish with impasto streaks of paint uncharacteristic of his usually subtle handling. In a photograph, it looks right. In front of the actual painting, it distracted me and felt like the part of an overexposed photograph where highlights wash out into too much white. In the end, though, the problematic fish and the way he painted them make the painting even more interesting. I’ve been surprised that the exhibit that has occupied my attention the most since my last visit to LACMA was Fantasies and Fairy Tales. It was a small, quirky collection of prints from around the year 1900. 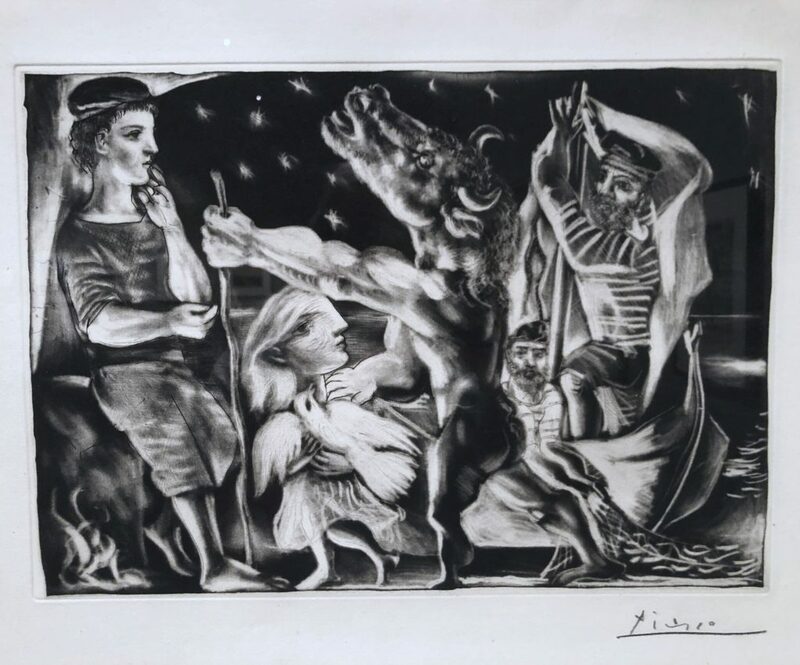 The aim of the exhibit was to show how, within this tight, curatorial window of qualifications (prints mostly within a narrow, fin-de-siecle range of dates), a selection of work could suggest incorporeal states of mind or spirit, as well as hint at transcendence. The show was beautiful and eerie, dreamlike and occasionally chilling. There was a slightly morbid strain in the imagery on view, but it was tempered with stylistic wit in the work itself and the playfulness of the curation. Charles Addams might have brought an Edwardian folding chair to this one, the better to take it all in. David Hockney etched a simple rear view of the prince nudging his horse up to Rapunzel’s dangling locks. 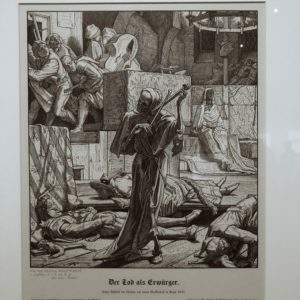 In Death the Strangler, Alfred Rethel engraved an image of a skeleton in a hooded monk’s habit pretending to play a fiddle with a pair of leg bones as people cowered around him. Max Klinger’s aquatint, Pursued Centaur, depicted three seemingly naked hunters chasing a centaur through long grass—right after the centaur has loosed an arrow backward into the leading horse’s neck. It shows you the moment when the hunters became the hunted. It’s all slightly magical, in an altered states sort of way. One would think only action painters would be honored as action figures. When you fail to get that Guggenheim Fellowship, and the Genius Award recedes beyond the horizon and MoMA looks less and less likely to put you into its permanent collection, take heart, as always, from Van Gogh’s non-existent career. Even if all else fails, a century from now they might make an action figure of you, only by then it will be fully animatronic and equipped with AI to keep painting in your style, perhaps even better than you do now. 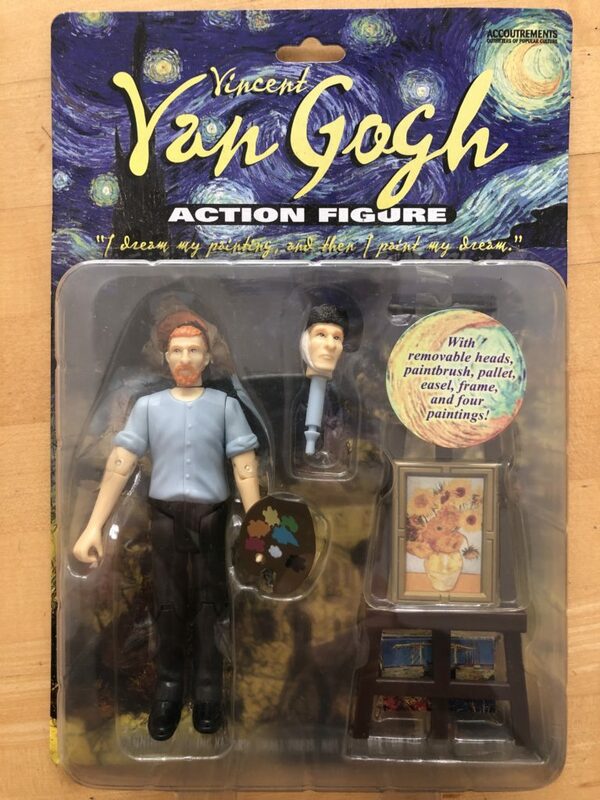 At last, action figures will live up to their toy category. I like how he comes with two heads, the one before and the one after he used that razor to turn his ear into a Valentine. 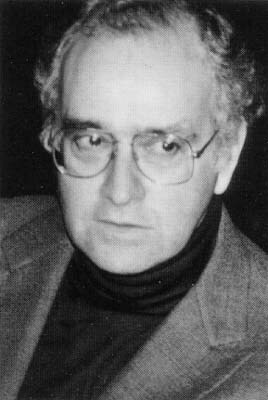 I had a recent email conversation with Chris Pulleyn, an old friend, a former employer, and a central figure at the Rochester Zen Center, where I’ve been a member mostly in absentia for a couple decades. 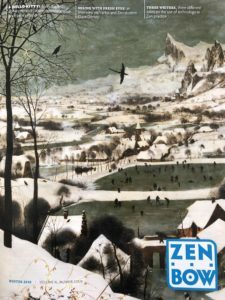 She asked me a few questions about the relationship between my still nascent meditation practice and my painting–so that she could publish some of my work and our conversation in the Center’s publication, Zen Bow. It was a wonderful gesture on the part of the people at the Center, and much appreciated. One thing that was fun about the conversation was that she had a hard time seeing common ground between the few paintings of skulls I’ve done—which struck her as very Buddhist, being emblems of mortality and impermanence—alongside my candy jars. It forced me to think about how much meditation has governed not only the energy I bring to painting, but also influenced my understanding about how painting works. What follows is a condensation of the Q/A in Zen Bow. My first encounter with Zen was in college, when I was a student at the University of Rochester. With a friend from my dorm, I attended my first workshop, run by Philip Kapleau, the center’s founder, in the early 70s. I began sitting then, and have been doing it off and on ever since—constantly trying to establish a daily habit. 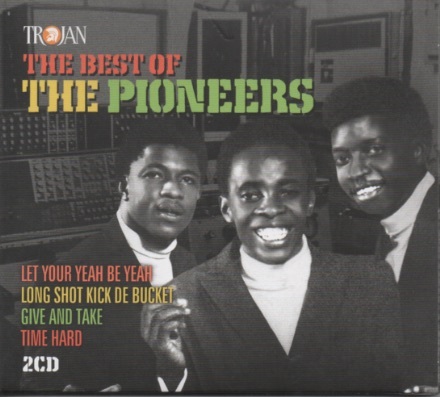 After I joined as an actual member in the 90s, I spent some regular time in the morning at the center but I’ve drifted into simply sitting at home. It was more than taking up something like yoga. It was, for lack of a better word, a philosophical pursuit. 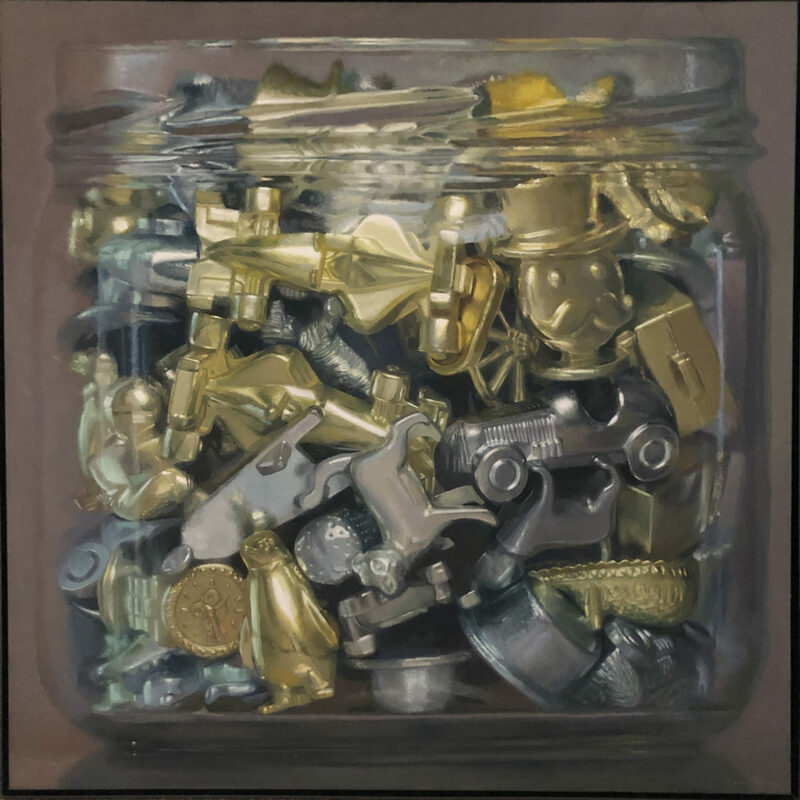 I was pleased to learn recently that Monopoly Board Tokens was selected for inclusion in Manifest Gallery’s 9th International Painting Annual. They received 1313 entries from 399 artists and picked 122 works by 73 artists from nearly half a dozen different countries. I was included in the INPA 8 as well, which is available, and will be shipped soon for anyone who ordered it. Thanks, Manifest. Note: this is one of three paintings in a triptych: as part of the triptych it’s entitled Renunciation: Monopoly Board Tokens. A preview of Jessica Brilli’s work, which keeps getting better and better, on view at Kobalt Gallery in August. 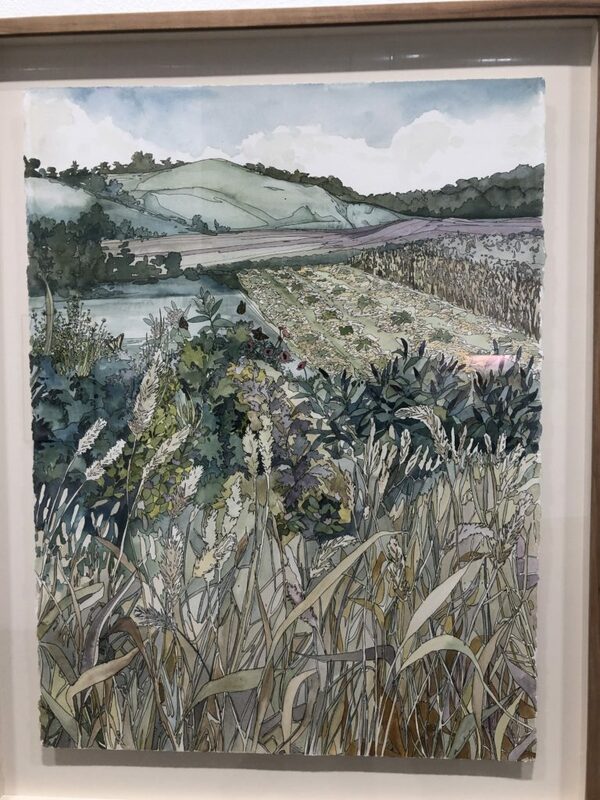 There’s a little more than a week left to see Among Untrodden Ways at Oxford Gallery, and it’s well worth the time to get there before it closes. Sean Witucki, Charles Houseman, and Ken Townsend are all working in the same stylistic neighborhood, but each of them has a distinctly individual vision. Of all the work from Witucki in the show, the standout is a small oil, only a foot in height, Wolf Creek After the Rain. The way he renders the water of the creek purling over the shallow ledge of laminated shale so common in Western New York is remarkable. Anyone who has hiked the Finger Lakes will recognize that hardened prehistoric mudstone, once the bottom of a sea, under such a thin layer of fresh water. The color of the water, from ochre to olive and then to a gray/greenish blue where it recedes to the far rocky bank, is amazing. The little fringe of foam, harmless whitewater to a wader, beckons to the viewer, but it’s what’s below that remains enticingly visible, an inviting but risky submerged surface, seen through ripples and reflections of the sky. He manages to capture that sense of being able to look into the water down to the slippery face of the creek bed—there’s more trouble here than the shallow depth would suggest. One wrong step and you’re on your back. The woods beyond are done with Corot-like flicks of the brush on soft masses of color. The image conveys a rapt, luxuriant pleasure in the paradoxical stillness, the restfulness, of water that never stops changing but always seems the same. Charles Houseman has contributed more than a dozen of his newest paintings to the show, and I reacted most strongly to the most elemental, his vision of the Maine Coast, Great Head at Low Tide, where rock, sky, trees and tidal pool compose a scene that—like Townsend’s shale—could have remained largely the same for a hundred thousand years. It perfectly captures the way the Maine coast seems assembled—or rather dropped into place by a receding glacier—to repel anyone who isn’t standing on dry land, while still inviting you through a jagged gauntlet of stone with its hazy beauty. One of his smaller paintings, Newton Farm, was a minimalist composition with a small strip of land beneath a blue void, an apophatic affirmation of energy through the absence of everything inessential, both pictorially and for anyone actually standing out in that open field, taking it all in. 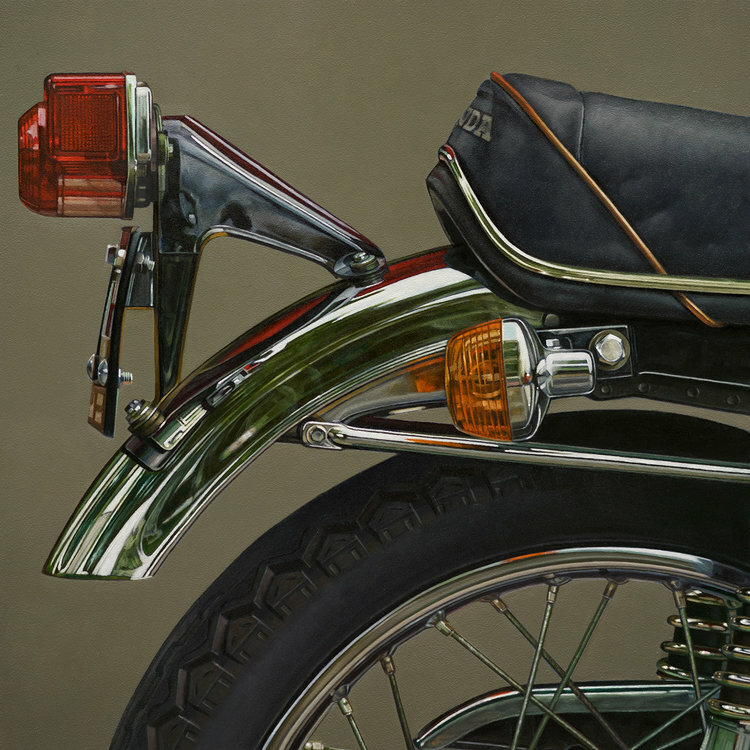 The revelation for me in this show is Ken Townsend’s assured versatility, where nearly every painting looks utterly natural while being carefully, masterfully designed. It’s his first appearance at Oxford and an auspicious one. Most of his paintings can be broken down into four areas of comparatively uniform value that lock together like a simple puzzle, with all the detail rendered as variations within that particular value—darkest, second darkest, second lightest and lightest. 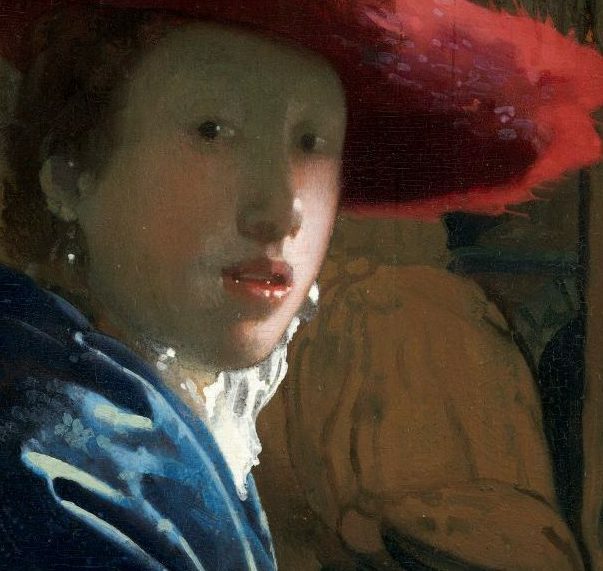 The way he gives each of these areas a clearly defined contour, compositionally, makes the paintings so visually powerful. It also enables him to emphasize and augment the color in each of these areas almost as an abstractionist would. He could push this even more than he does, but when he allows himself some rich hues, the colors are beautifully chosen, deeply felt. This is readily apparent in work like Gardner’s Road and Mendon Ponds, an overhead glimpse of water lilies, with one small white blossom serving as the tiny, lightest section. 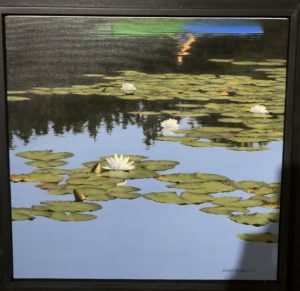 Yet a second painting of probably those same water lilies, Dar Reflected, is a perfect example of how Townsend is able to lay down areas of vibrant color by emphasizing and unifying those four areas of value and working within them as a structure for the image. All the viewer sees is a flat stretch of violet water, reflecting the sky, throughout most of the lower half of the painting, broken up by a cluster of lilies with one blossom, and then in the upper half of the canvas, the reflection of the dark woods and at the top, what appears to be the rippled reflection of a two-toned kayak with a slash of pink for the paddler. Keeping out of view what would have been the subject of the whole painting for most painters (Eakins, for example) is what enlivens the entire scene. The brilliant blue and green of that reflection draw your eye and then leave it wanting, hinting at what’s almost visible, so that what you actually see feels more like a memory or a dream of something even more alive than what’s available to the eye. 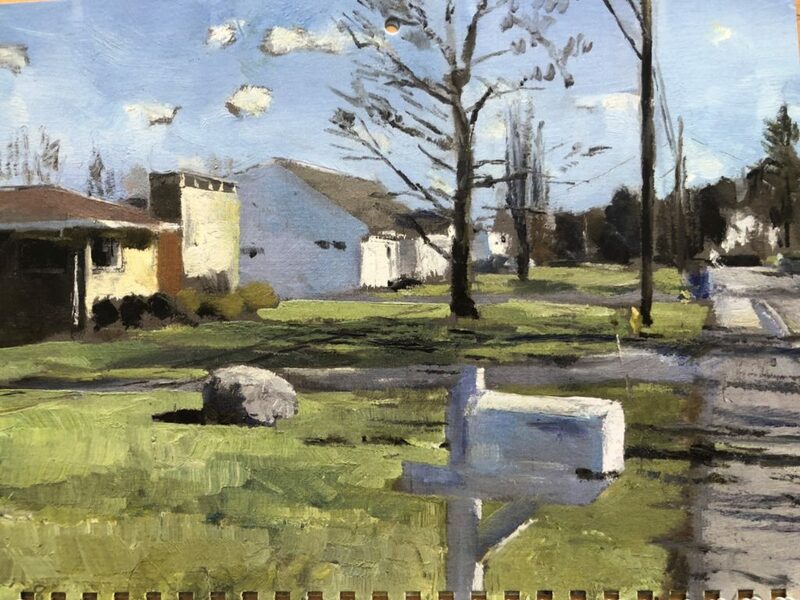 The Townsend painting that knocked me out, though, was a very small square one, Roadside I, executed with palette knife. The technique, though rougher and more approximate than any of the paintings done with brushes, creates a snowy embankment almost more visually convincing than anything else in the show—with a tremendous sense of clarity. Again, he’s broken down what he sees into continuous areas of value, the darkest, a line of trees on the horizon, then the brightest strip, in the patchy snow just beneath it and then, above and blow these two tiers of color, the cerulean sky and a violet reflection of the sky in the snowbank, sharing almost the same value, with a triangle of road at the bottom, the second-darkest region of the image. He captures everything perfectly, the low sunlight scudding almost horizontally across the embankment, the becalmed sky, and the purple shadows that look scraped into the soil and driven over by a plow or a truck, yet without any indication of exact detail in the thickly scumbled paint from under his knife. The eye sees what it expects to see though it isn’t really there. He works into the image not just the purple of the snow and the classic blue of the sky but a little strip of orangish growth along the tree line, a color also breaking through the snow in the foreground, that makes the other colors sing a little more distinctly. It’s a perfect painting, hopefully hinting of more to come.
. . . the eye that puts aside all it knows, that puts aside all preexisting insight, is the eye that can see the world anew, as if it were emerging before it for the very first time. 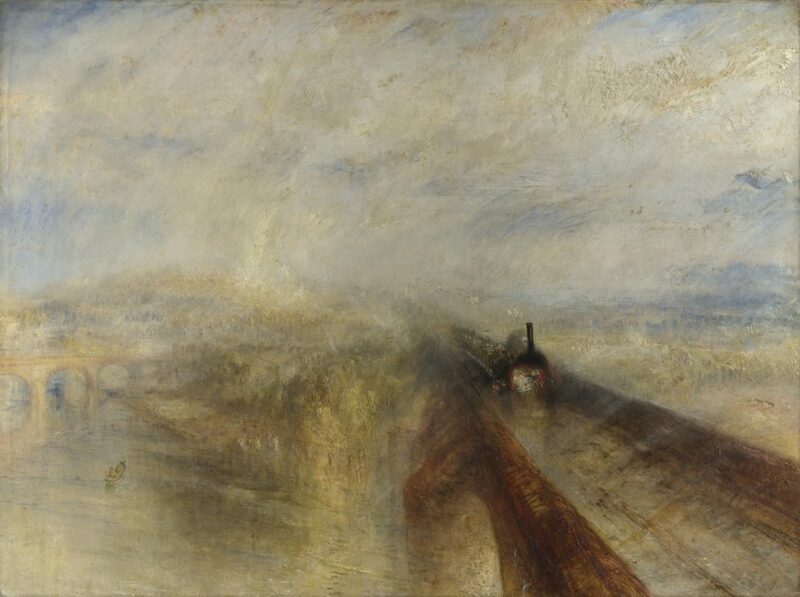 Turner was interested in the relationship between the inconstant and the immutable, the solid and the fluid, and in that way the train becomes an expression not of anything else, one of the many categories into which it might be placed to do with modernity, industrialism, civilization, and the man-made, but only of what it is in itself, in pure physical terms, an enormous iron object proceeding along an iron track, almost obliterated by the snow, which would obliterate almost any other object in the same way: a sailing ship, a horse-drawn carriage, a funeral procession, a bear. The painting shows how dwarfed this massive iron horse appears in the context of a nature overpowering and sublime. Our view of nature now is both the same and the opposite: in the “anthropocene,” we constantly tell ourselves that we are changing everything around us, spoiling it and twisting it into a state of imbalance and disorder, and we makers of engines are going to incite nature to violent storms and deadly droughts and massive, hostile phenomena akin to what Turner was depicting. The difference is that now we think our little engines, our technological and chemical footprints, cause the storm that envelopes them and threatens their and our disappearance. Now the engine in the painting, as it were, creates what dwarfs and erases it from view–we are the storm. As usual with human beings, it’s all about us. Knausgaard glosses over Turner’s awe and passion for nature’s beauty and power, no matter how hostile it becomes to human life, his Romantic devotion to nature as a new sort of God, a source of mystery, if not meaning. He’s right that Turner wasn’t trying to illustrate an idea, but convey through perception and intuition the relationship between human life and a larger, implacable world–the way Chinese scroll paintings juxtaposed tiny human figures against beautiful, craggy mountains, putting us into proper perspective within the whole. (It’s nice that the Sung Dynasty had no locomotives to include.) 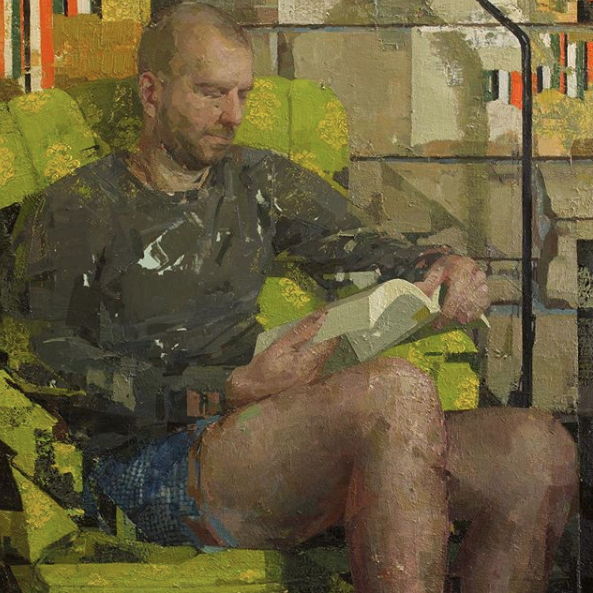 Man isn’t the measure of all things, in those paintings, except as a unit for judging the scale of a world infinitely more extensive than the human body and human concerns. When I was growing up, in both East St. Louis and then in Idaho, my family lived at the edge of undeveloped land. These havens for my imagination weren’t protected, just overlooked or privately owned—undisturbed stretches of wildlife and undergrowth, a mix of grassy slopes, streams, and wooded paths. In a suburb at the edge of East St. Louis, it was a small copse at the base of the hill behind our little Cape Cod, and in Idaho, from our home sitting at the rim of the bench—just above the Boise Valley—I could walk to the edge of our back yard and look down at a fenced pasture with horses and, alongside it, the only human development within a convenient walking distance from the base of the slope, a sawmill. (We had some dangerous forbidden fun bounding across those floating logs.) My friends and my brother and I would spend hours in those spaces, only dimly aware of the smells, the soft feel of the earth, the birds and insects—yet all of it was imprinting itself on my mind whole, planting in me the desire to grow things as an adult and to get outside whenever possible. 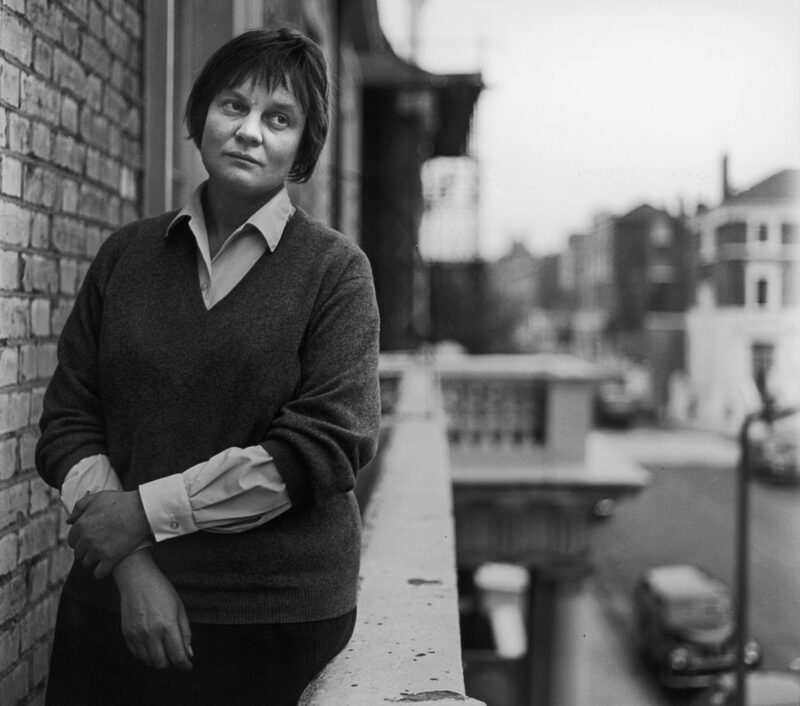 In those little overlooked tracts of wildness, I felt in touch with myself and the world in a way that I couldn’t in school or inside our home, in front of a television, the only screen that existed back then. There’s a surplus of artwork on view in Rochester right now devoted, more or less, to the symmetry between human nature and the natural world. (Thou art that, the ancient Hindu philosophers would say.) In a fortunate coincidence, while Oxford Gallery is showing the work of three masterful landscape painters, Rochester Contemporary Art Center has assembled a themed show, Landscapes and the Unbuilt, that celebrates the slightly paradoxical effort that we human beings are making to keep from spoiling places like the ones that helped shape me as a kid. We’re intervening to prevent ourselves from, well, intervening. 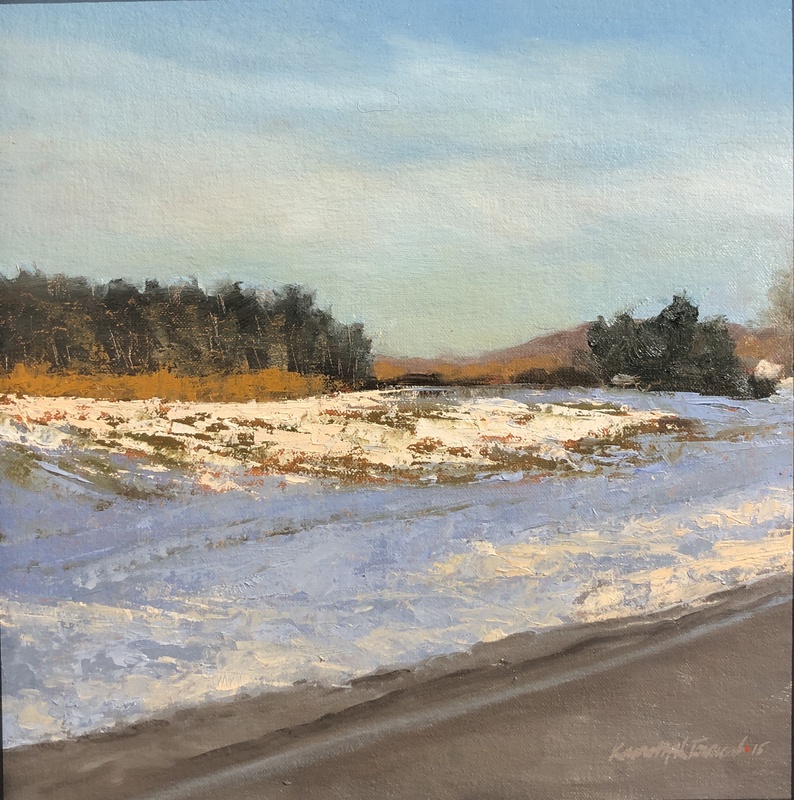 For the RoCo show, a group of artists took as their subject a particular parcel of land under the protection of the Genesee Land Trust, and they created one or more works to capture the spirit of the place. The work is all marvelous, especially grouped together in a way that amplifies each individual effort—and some of it represents the best work I’ve yet seen from these particular artists. 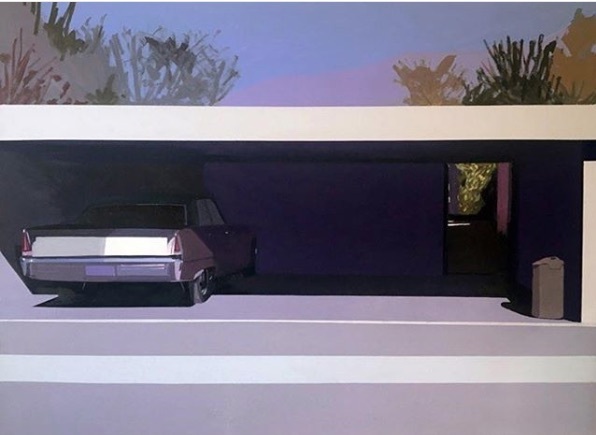 The terms of the show may have brought out new dimensions in their work by forcing some of them to pay attention to the particulars of a specific place. My next post will be about the current, marvelous exhibition at ROCO: a group of artists showing work that celebrates a particular place worthy of preservation in this region. But first I wanted to catch up on Jim Mott, whose own work would have found a place into that show if only he hadn’t had a solo exhibition there just a short while ago. Jim does, all of the time, what the artists now on view at ROCO did simply for the curatorial purposes of the exhibition: to pick a place, sometimes at random, and depict whatever he sees as equally worthy of consideration, no matter what it is. Jim: I’ve been reading this longish book. Richard Powers? A friend of mine from Nature Conservancy gave me this novel of his about trees. The first half is brilliant but the second is good but not as exciting. He takes nine different characters, odd people who are moved by trees toward something and then he goes to a showdown in the Northwest. It’s intensely poetic and full of information. He got a genius award. Jim: He gets all ecstatic about trees. I didn’t loan you Julian Bell did I? I don’t think so. Are you still communicating with him? Jim: Yeah, I have an open invitation if I ever get to England. RYMAN: I came from music. And I think that the type of music I was involved with—jazz, bebop—had an influence on my approach to painting. We played tunes. No one uses the term anymore. It’s all songs now, telling stories—very similar to representational painting, where you tell a story with paint and symbols. But bebop is swing, a more advanced development of swing. It’s like Bach. You have a chord structure, and you can develop that in many ways. You can play written compositions and improvise off of those. So, you learn your instrument, and then you play within a structure. It seemed logical to begin painting that way. I wasn’t interested in painting a narrative or telling a story with a painting. Right from the beginning, I felt that I could do that if I wanted to, but that it wouldn’t be of much interest to me. Music is an abstract medium, and I thought painting should also just be what it’s about and not about other things—not about stories or symbolism. ART21: You don’t think of meaning? RYMAN: There is a lot of meaning, but not what we usually think of as meaning. It’s similar to the meaning of listening to a symphony. You don’t know the meaning, and you can’t explain it to anyone else who didn’t hear it. The painting has to be seen. But there is no meaning outside of what it is. ART21: So, meaning is closer to an emotional reaction? 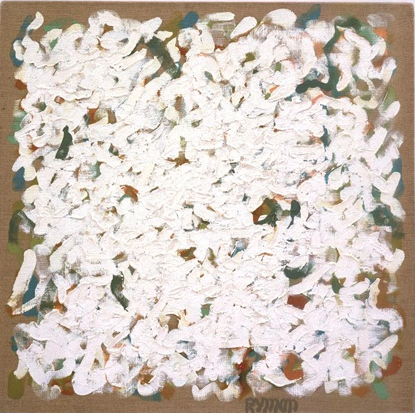 RYMAN: I think that’s the real purpose of painting: to give pleasure. I mean, that’s really the main thing that it’s about. There can be the story; there can be a lot of history behind it. But you don’t have to know all of those things to receive pleasure from a painting. It’s like listening to music; you don’t have to know the score of a symphony in order to appreciate the symphony. You can just listen to the sounds. 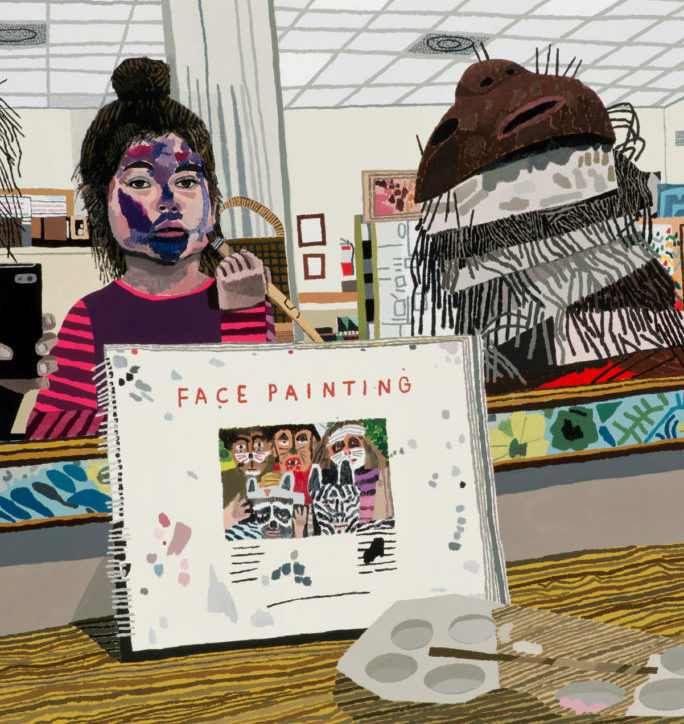 ART21: How does your work fit into the contemporary art world?